Buried at Arneke Military Cemetery, Near Cassel, France. Thomas Abraham was born around 1896. That would have made him close to 20 years of age at the time he died. He was one of at least five children that were born to William and Alice Abraham. 20, Shingrig Road, Nelson in the Parish of Llanfabon. William earned his living as a hewer, working underground at Penallta Colliery. Alice remained at home to look after the family. Emily was the eldest child, born in Nelson around 1892. Next came another daughter, Winifred who was born around 1894. Then saw the arrival of Thomas, the first and only son in the family. William and Alice had a further two daughters, Clarice, born around 1897 and Lilian was born around 1900. Thomas’ mother Alice was the only member of this family who spoke only English, while all the others, including William spoke both Welsh and English. Thomas, Clarice and Lilian retain the Abraham family name, and are shown as Step-children of George, the family head. They have now made their family home in a five room house at 18, Torlais Street, Newbridge, Monmouthshire. Thomas’s father, William had met his death during the middle of 1901, aged 30yrs. 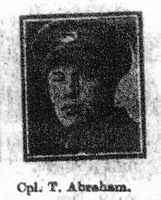 Official news received on Wed week of the death in action of Corporal Tom Abraham 13882, South Wales Borderers, son of the late Mr & Mrs William Abraham. Corporal Abraham enlisted early in the war and had seen much service in France. He was well known locally and he was born in this village. He had been employed at Penallta Colliery and resided with his uncle and aunt, Mr & Mrs John Barnes, Wern Crescent.